First of all, if you ever get the chance to see Halestorm live, do it. I’ve seen a lot of bands who are great live, but they are truly something special. And that’s exactly what they’ve tried to capture on this, their third album, Into The Wild Life . It’s aptly named, as they’ve strived to create something new, breaking down all rules and limitations they (or anyone else) had previously placed on them. It was recording uniquely, with the whole band playing every song from start to finish, rather than breaking each track apart, which really helps to capture the energy and authenticity that live shows have, and albums often lack. In line with their previous releases, this album is raw and sensual and dirty, full of riotous, classic rock’n’roll. Tracks like ‘Mayhem’ and ‘Apocalyptic’ are big, bold and aggressive, with fast tempos, and pulsing with energy, sounded most like their older songs. However, they are interspersed with more experimental tracks like ‘New Modern Love’ and ‘Bad Girls World’, which take on a slower, sultry, seductive tone. Sometimes the continual shift of tempos between each track feels a tiny bit jarring, but this is a minor concern. These aren’t tentative experiments; the whole record is bold and entirely unapologetic, throwing all caution to the wind. This is proven in the lyrical content, with tracks such as ‘I Am the Fire’ and ‘Sick Individual’ asserting an unfailing confidence, ‘Apocalyptic’ is explicitly sexual, and ‘Amen’ is a rousing, choir-like ode to everything important in life. Even the love songs take on a different slant to the conventional, such as ‘What Sober Couldn’t Say’, expressing the drunken honesty that I’m sure many of us have experience before. ’Dear Daughter’ is a slight departure from the other tracks, a soft, emotional piano ballad, full of world wisdom that so many young girls will relish hearing. Personally, the aggressive, high-energy songs are my favourites, ahead of the slower tracks, as I love the passion and sheer enthusiasm thrown into them - 'I Like It Heavy' is a particular standout - but I can’t fault a band for experimenting a bit, and still producing some pretty great tracks when doing so. While the melodies and riffs are strong, catchy and superbly-executed, with some gorgeous guitar solos thrown in, it is Lzzy Hale’s powerhouse vocals that bring the whole record together. Her voice is outstanding in any circumstance, but the ‘live’ style of recording has allowed her raw, emotional quality to seep into every track, lifting the album to a whole new level of attitude. I’ve written before about what an exceptional front woman she is, and on this record she has proved that she can be just as good on a recording as she undoubtedly is when performing live. 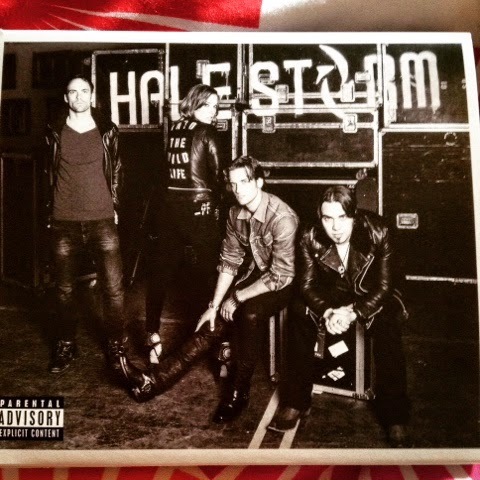 Overall, it’s a solid album, full of performances that show just how good Halestorm can be. They’ve thrown out the rule book and flexed their musical muscles, and emerged bold, brash and triumphant.